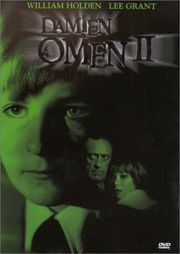 I did not realise how often I apparently watched that film during my youth – the first Omen movie did hardly contain any scenes that were not linked to specific memories or associations. And that even though (or because?) one aspect that I remember is complete annoyance at the tv censors who apprently butchered the film for tv disctribution, and in a clumsy way so that each cut element was very apparent and led me to want to see the uncensored version. Only now I did, and indeed there are some very nice and gory details. I never realised how well the decapitation scene is actually done, and I guess the same applies to the second part’s “elevator scene”, which I could hardly remember, because in the tv version it is rather unremarkable… not so in the uncut film. Part 1 is clearly the much better movie, with a mean-spirited script that gives the regular viewer of Gregory Peck movies some hope and comfort, plays with his stamina as hero head of family and career politician – only to use it against him. A very nicely cast young Damien is just outright creepy, especially in the passive role he has to take at this age. He hides behind a chair when things get rough, he has no means against his enemies but to cry and scratch his mother’s face. Part 2 needs to establish a more active Damien, but in a transition period of discovering who he actually is. That is not bad at all, but in order to raise the level in contrast to part 1, the film falls into the trap of overdoing it and creating too many set pieces to show in how many ways you can get killed if you start messing with the Antichrist. That is nicely done for each of the scenes, but a bit tiring in its steady rhythm. Still, there are remarkable scenes: when one character drowns under the ice, that is a scene that has been haunting me since I first saw the movie decades ago. The opening with the return of the (unfortunately in both films under-utilised) Bugenhagen character and him meeting his fate… very memorable as a form of death you do not want to encounter. Update: I actually did watch the third part, and it’s not very good. 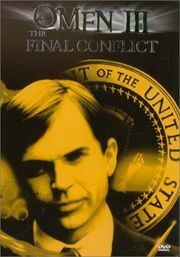 Surprising to see Sam Neill taking over the Damien role, must have been one of his early appearances, and a surprise his carreer did not end there and then. Actually, he has a good enough face for it. A bit pretty-boy, a bit creepy. But the film as such disappoints by turning around the premise of the second one: now it is suddenly not all seven daggers that can kill the Antichrist, but one is sufficient, so the plot rolls out in exactly the expected fashion. I cannot think of any memorable scene, except maybe the fox hunt, where a streak of silence creates some form of threat. The end comes suddenly – and how shall we ever be happy without Damien and his minions?? Oh, easy. The Omen (film series) – Wikipedia, the free encyclopedia. 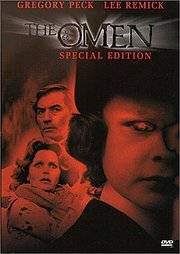 The Omen was one of the first horror films I remember seeing. Scared me senseless. Loved it though. And still love it today – great horror film that strikes a perfect balance between gore/violence and slow-burning suspense. Gregory Peck is great too. I’m not a fan of the sequels. There’s something less chilling about Damien when he’s older and more consciously causing havoc whereas in the original film the chills came from this malevolent force that seemed to be helping him.